Phyllis Schlafly’s February Report warns of the dangerous consequences of a National Popular Vote which is being advanced by lobbyists being sent around the country. These NPV lobbyists are urging state legislatures to enact legislation instructing their presidential electors to vote for the candidate receiving the most number of votes nationally without regard to their own state’s vote. When enough states totaling 270 Electoral votes have signed the compact, then the National Popular Vote will replace the constitutional Electoral College and could possibly result in the election of a plurality candidate considering the number of political Parties on the ballot. The Platform of the Republican Party of Texas calls for preservation of the Electoral College system. Unfortunately, all of this subterfuge is taking place while we are pre-occupied with the Republican presidential debates. To date, eight states with 132 Electoral votes (Vermont, Maryland, Washington, Illinois, New Jersey, District of Columbia, Massachusetts, California and Hawaii) have signed on to this compact—half-way to the 270 needed-- If there had been a NPV in the year 2000, Al Gore would have been elected! Mexico uses a national popular vote system and is a good illustration of why we don’t want it here. In Mexico’s last presidential election, the candidate with the ‘most votes’ received 35.89% while his closest rival got 35.31%, a margin of just one-half of one percent. In the months that followed, Mexico was on the verge of civil war as the runner-up held mass protest rallies attracting millions of his angry supporters. Wherever voters live, they should contact their State Legislators and insist they preserve their state’s Electoral College as intended by the Constitution, and to vote NO on any legislation calling for a National Popular Vote. The National Popular Vote Plan does not eliminate the electoral college. It could not possibly do so, because the Electoral College is in our Constitution. The National Popular Vote Plan merely changes the traditional way states have awarded their electoral votes. The unrest in Mexico after the close direct popular election was not because the election was close, but because the losers believed that the vote county was not accurate. The U.S. founding fathers wrote the electoral college system not to guarantee that all states had a voice in electing the president, but to placate the south, which had a huge population of adults who could not vote (the slaves). 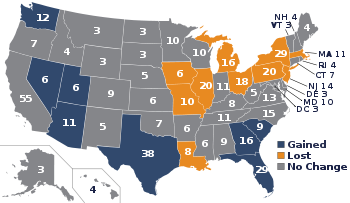 If we were starting out as a nation with a brand-new constitution, we would never create the electoral college system. It is dangerous to put all the power to choose the president into the hands of 538 miscellaneous people whose names aren't even known to the vast majority of us. France has a direct popular vote for President, with a run-off two weeks later if no one gets 50% in the first round, and that works fine. We elect all our Governors with a direct popular vote. If we go to a "popular" vote, candidates will only have to campaign in major urban areas, New York, LA, Chicago, Boston, Atlanta, Houston, San Francisco, etc. That's where the votes would be. See a pattern? A conservative would never be elected again. Government would be all about "metro" rail-type projects and programs for the inner-cities like government housing. The focus would be entirely on the needs of the urban areas, without regard to the producers of food and energy. Our founders knew exactly what they were doing when they set-up the Electoral College. Socialists know exactly what they'd be doing by getting rid of it! "If we go to a "popular" vote, candidates will only have to campaign in major urban areas, New York, LA, Chicago, Boston, Atlanta, Houston, San Francisco, etc. That's where the votes would be. See a pattern? A conservative would never be elected again"
By your logic, Texas would never elect a Republican governor, due to Democratic campaining in Houston, Austin, San Antonio etc. And by your logic, no Republican would ever win the national vote count. Thus: your argument is false. What is horrible with today's system is that the most people in US never have a real in incentive to engage in the presidential election, because their votes cannot impact the outcome (if they don't live in a battleground state).